Halloween is almost here!! I LOVE making costumes and a few weeks ago, I posted this tutorial as part of The Train To Crazy’s Handmade Costumes series – click the link to see all the creative costumes that have been shared so far! 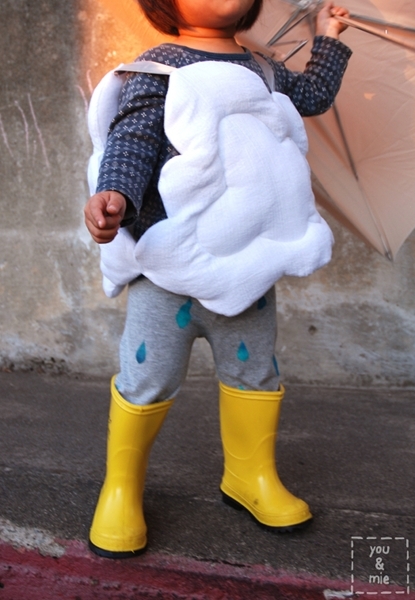 Since then, this costume made it onto the list of 21 Most Clever Halloween Costume Ideas for Kids on Babble, was selected as inspiration for Craftbaby’s DIY Halloween Costume Contest (go check it out and enter your costume!) 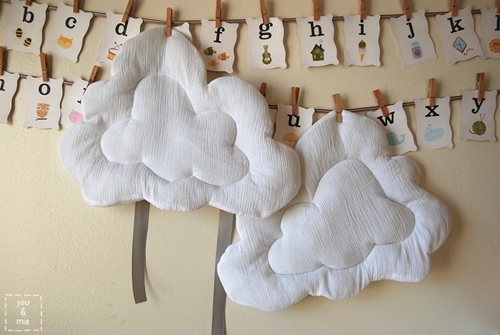 and yesterday it was featured in a Martha Stewart Living article, DIY Kids’ Costumes from our Favorite Bloggers. Martha Freakin’ Stewart, people!! I nearly died. (Check out Kristin’s Fanstastic Mr. and Mrs. Fox outfits on the Babble and MSL lists too!) I really didn’t expect any sort of reaction to this simple costume, so I’m, quite frankly, shocked. And psyched. Anyways, I wanted to bring this post home in case you didn’t see it and since Yuki was feeling under the weather (get it!? :P) the first time around, I decided to take some new pictures for this post. Enjoy! Over the last several years I’ve made quite a few costumes including a Totoro costume for my daughter (it was a big hit!) and several others you can see here, including Russell from the movie, Up. But I’m a total procrastinator and also super indecisive, so I haven’t even started figuring out what my daughter, Yuki, will be for Halloween this year. So in the meantime, I thought I’d whip up a simple costume using only materials I already had a home. Presenting . 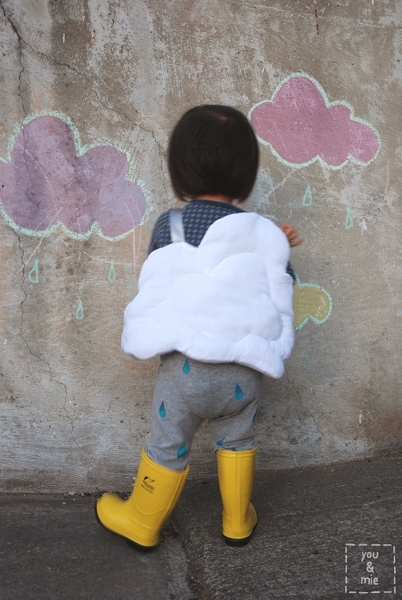 . . the Rain Cloud costume! I wanted to make something pretty simple and very comfy. I knew that Yuki would not be down with anything too big or cumbersome attached to her, so I kept it small. And a lot of this stuff, you might already have at home! So let’s get started. Here’s what you’ll need. The part of this project that took the longest was waiting for the fabric paint to dry on the pants, so I would start there. 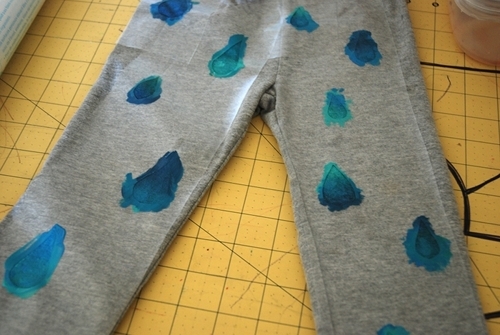 Make rain drop stencils from the contact paper and stick them to your pants. 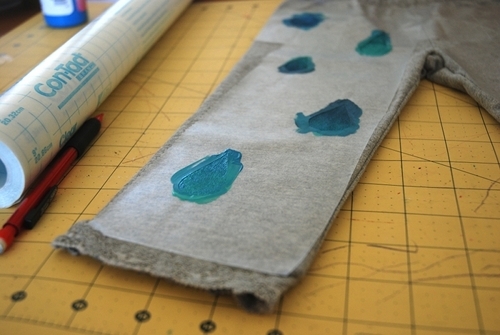 Use fabric paint to fill in your stencils (be sure to read and follow all the directions on the paint that you use). I made 3 shades of blue and used two for each rain drop for a kinda gradient/ombre look. I painted the pants in 3 stages – first the front of the pants, then when that was pretty dry, I removed the contact paper stencil and flipped it over and painted the back. 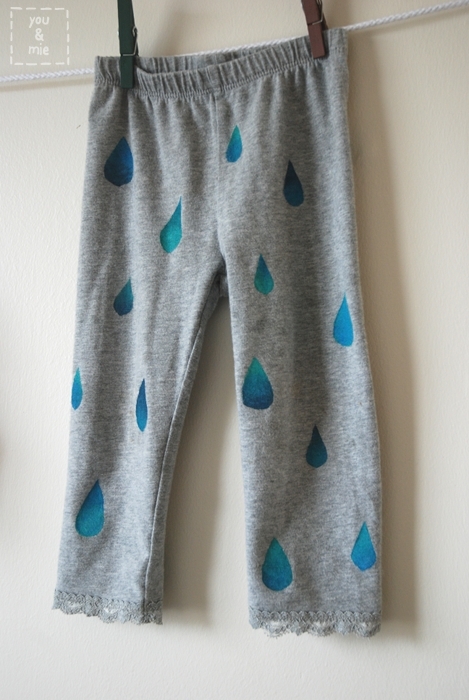 Then I split the pant legs open and painted a few more drops down the outside of the legs. After the paint is almost completely dry, I hung them up to finish drying completely over night. And those are da-DONE! 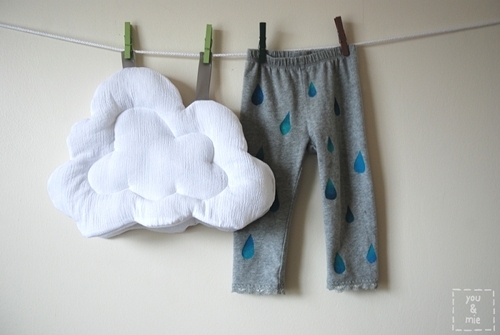 In between the stages of painting and drying, you can work on your cloud. 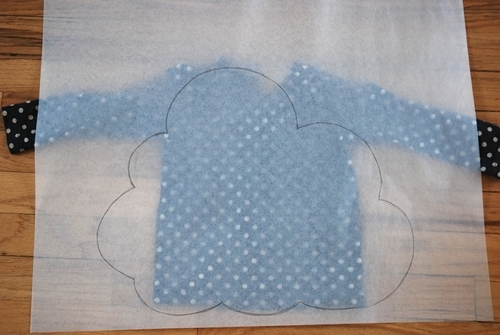 First, use a shirt to draw out a cloud pattern. You’ll want the sides of the cloud to extend past the edges of the shirt (we’ll connect them later), but the pattern shouldn’t go past the shoulder to restrict arm movement. 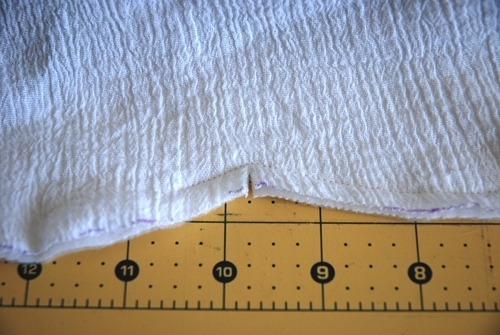 Add seam allowance. Cut out 4 layers of the cloud pattern. 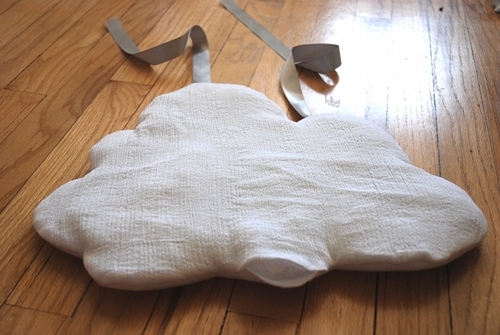 I used fleece for the inside of the costume and gauze for the outside, so 2 clouds of each fabric. Cut 2 pieces of ribbon for the straps. Lay the inner fabric right side up, then the ribbons right side up. 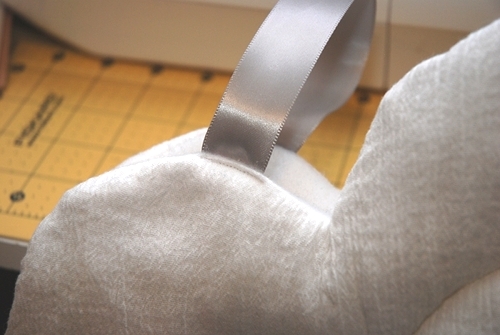 Lay the outer layer right side DOWN, being sure to tuck all the ribbon inside the cloud. Pin the layers together. When you sew the back of the costume, be sure that you flip the direction of the pattern. Sew around the cloud leaving an opening in the bottom. Snip each point close to the seam. Turn it right side out and press. Fill with a thin layer of batting or fiberfill. Hand sew the opening shut. 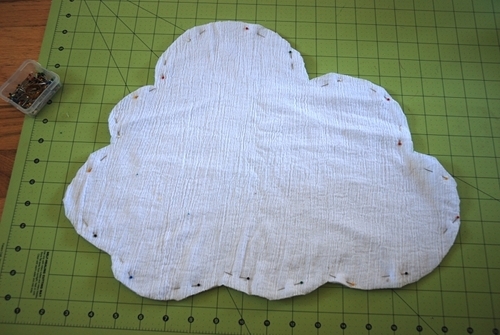 Quilt the cloud however you like to hold the filling in its place. 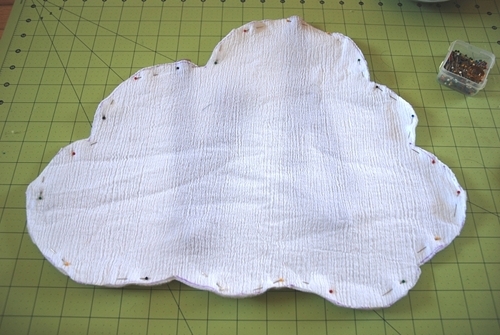 Stack the clouds right sides out and sew the edges together. Try it on your model and mark how long you need the straps to be. 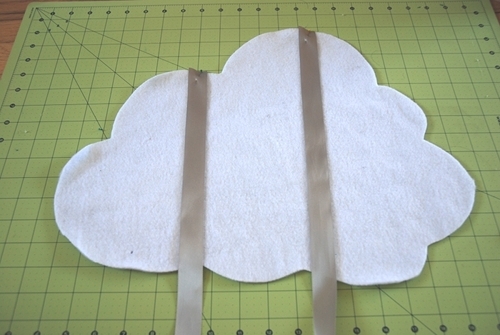 Trim your ribbon, fold the edge under and sew it to the back of the cloud. 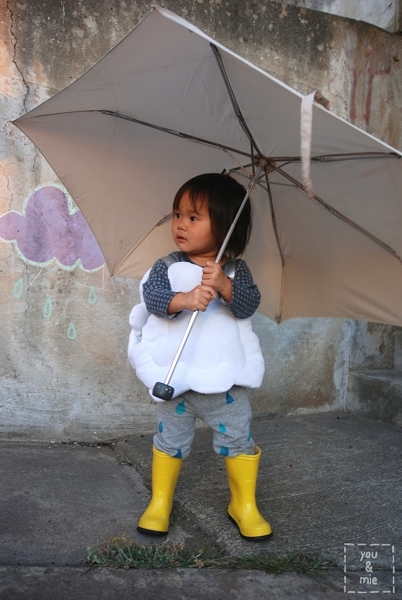 Pair it with some rain boots if you got ’em! 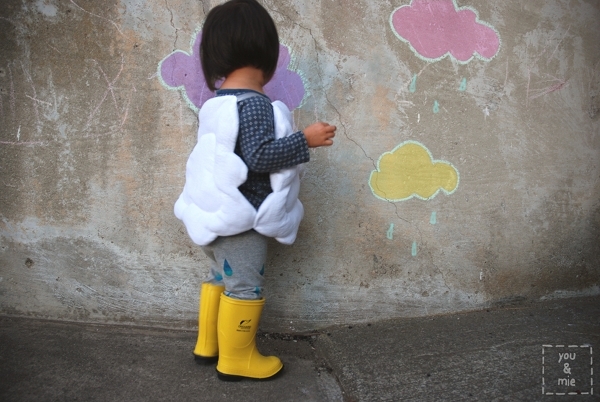 Sad cloud . . . err, happy cloud? Yuki actually has a pair of rainbow striped pajama pants that would give this outfit a totally different look! I bet there are a bunch of ways this costume could get adapted. Thanks for having me, Andrea! I’m loving all the handmade inspiration in your series and feel lucky to have been a part of it! 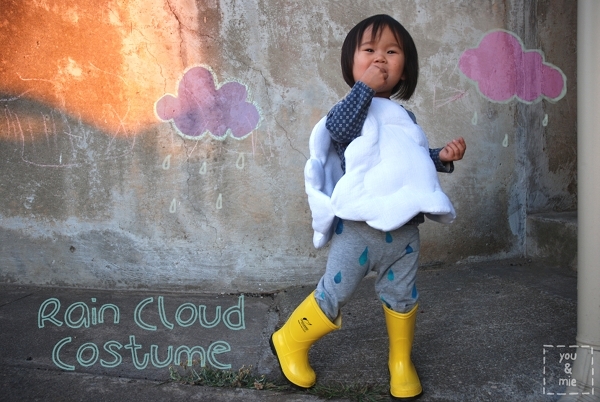 This entry was posted in tutorials and tagged cloud costume, costume, halloween, kids costume, rain cloud by Cherie. Bookmark the permalink. How adorable! What a fabulous costume, and such a little cutie modelling! I have masses of black furry material that I am planning to make halloween costumes for my boys with. I just haven’t decided what yet – likely to be bats or spiders! Nice! A bat costume was one of the first that I made and I look back on it fondly 🙂 Good luck! I love it! Simple yet so cute! Perfect! Congrats on so much fabulous and well deserved attention! Oh my gosh that is so awesome, martha! Oooh, I’d love to see it if you do! Reblogged this on Tree of Love Organics. I don’t know how I missed this everywhere! so very cute and I”m sure you could do a sun costume much the same way if you needed a pair. How cute! Yes!! You could do a whole bunch if you wanted to – a rainbow, a shooting star . . . what else? This is so cute! I love your handmade.I just made a peter pan costume for my 3years old son but haven’t done anything for my baby girl. 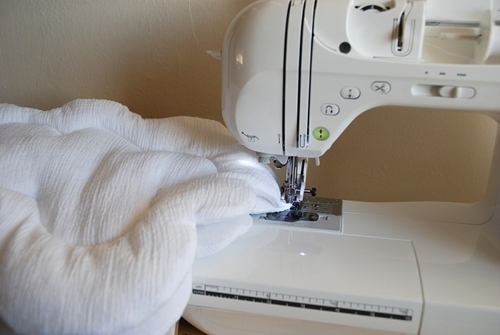 Thanks for sharing your cute sewing tutorials! PS: My sister’s name is Mie, too :-)! Really nice costume! and Yuki looks always beautiful! WAY cute. Thanks for the shout outs, and I’m glad you brought it home with those great new photos! Silly Yuki doesn’t know how adorable she is. Very very cute good job!!! I am not at all surprised that you were featured by Martha. When I saw this the first time I gasped. It is so clever and SO cute. Love love. Congrats! This is just the cutest costume and I love the new pictures. Congratulations on all the features, they are totally deserved though. Looking forward to seeing what you do for Halloween. This is adorable! What an amazing idea! thanks for the clear how-to! I made this costume for my two year old last year! It was so cute! I paired it with frog rain boots and it worked out perfectly that her winter coat last year was a pale blue color (Halloween is cold here in the Midwest). She had requested to be a witch next year, but I’m due with a new little girl any day now so I’ll have another little one to wear it in a few years. Aw, thanks! You know, there was a time when I didn’t know anything about sewing either! 😛 We all start out that way – you should give it a try! That’s very true! Did you take a class or did you teach yourself? Well my mom taught me the basics of how to use a sewing machine and get started with simple sewing projects like pillow cases or drawstring bags. Everything else I learned from online tutorials and pattern instructions! If you’re starting from the very beginning, it might be nice to take a class so you’re not doing it completely alone, but there are plenty of people who are self taught too! Oh wow – such a cute costume – I love it! I have to share something with you, there is a creative costume contest over at http://www.halloweenhero.com/costume-contest-2013.html and the grand prize is $250. Just thought I’d pass this along in case you or your readers are interested. 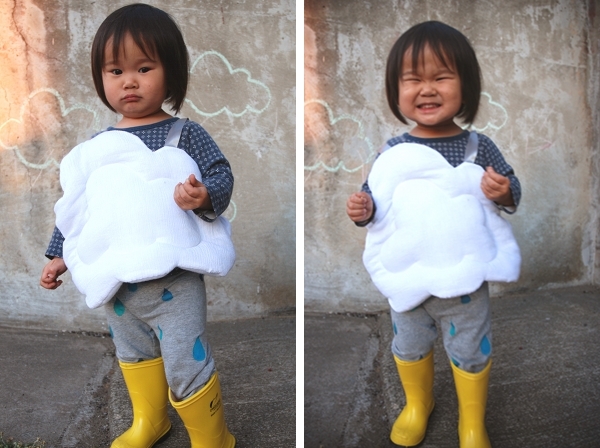 Thanks again for sharing this adorable rain cloud costume – it’s a winner!